Roger Federer has won 17 Grand Slam titles and spent 302 weeks as the world's number one player. His 995-match wins have yielded a total of 82 titles, of which six came at the World Tour Finals and another 23 at Masters Series level. He became an Olympic champion in Beijing in 2008 - but has never won the Davis Cup with Switzerland. "There's so much more than tennis in life, but clearly it's a big deal, no doubt about it," Federer said, as he reflected on the importance of adding the Davis Cup to his glittering list of achievements in Lille this weekend. The closest Federer has come to winning the competition was in 2003, when he relinquished a two-set lead to Australia's Lleyton Hewitt and lost the pivotal fourth rubber of the Melbourne semi-final. 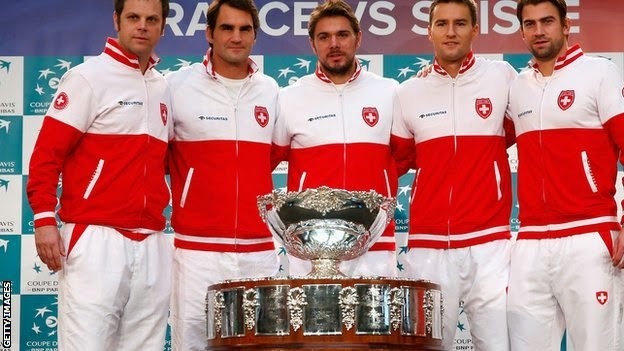 Would he have any cause for regret if he retired without helping Switzerland win a first Davis Cup title? Should it in any way affect the way we view him as a player? There are many who believe that Rafael Nadal - with 14 Grand Slams to his name by the age of 28, plus an Olympic singles gold and four Davis Cup titles - should be considered the greatest player of all time. It is a question Federer answered more directly in an interview with USA Today at last week's World Tour Finals in London.